Wits End Cottage in Roughton, near Woodhall Spa, Lincolnshire sleeps 2 people. Wits End Cottage near Woodhall is a lovely detached cottage which is set in the grounds of the owners’ thatched farmhouse and is a perfect touring base or ideal for simply sitting back, relaxing and enjoying the peace and quiet of the countryside. Wits End Cottage is close to Woodhall Spa and Horncastle, and is only 25 minutes into the city of Lincoln and about a 30-minute drive to the traditional seaside resort of Skegness. For days out by car, on foot or by bicycle, the Lincolnshire Wolds, which is designated as an Area of Outstanding Natural Beauty, is close by. From the doorstep are good walks and cycle routes, and the Battle of Britain Memorial Flight for WWII enthusiasts is at Coningsby, just a 15-minute drive. The shop is 3 miles from Wits End Cottage near Woodhall, with the pub and restaurant 1 mile from Wits End Cottage. 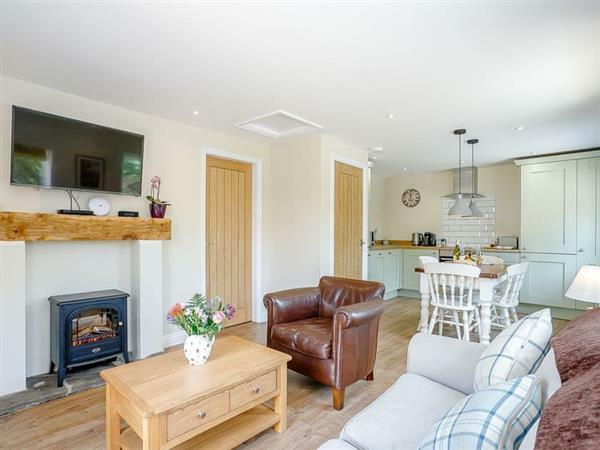 Living area: With electric wood burner, 42 Sky TV (full package), DVD player, iPod dock and French doors leading to terrace. Electric central heating, electricity, bed linen, towels and Wi-Fi included. Travel cot and highchair. Welcome pack. Large enclosed terrace with sitting-out area, garden furniture and gas barbecue. Hot tub for 4 (private). 2 small dogs welcome. Bike store. Private parking for 2 cars. No smoking. Holidays at Wits End Cottage run from Friday to Friday. Pets allowed at Wits End Cottage. For a better idea of where Wits End Cottage is, you can see Wits End Cottage on the map below. Wits End Cottage is in Lincolnshire; should you be on the lookout for a special offer, you can find all the special offers in Lincolnshire. It's always worth checking to see what is on offer at the moment. Do you want to holiday near Wits End Cottage (UK11125), you can see other cottages within 25 miles of Wits End Cottage; have a look to find your perfect holiday location.